✓ A new survey points to an unrecognized need to provide palliative care to patients with end-stage Parkinson disease. BOSTON—The severity of pain and suffering in Parkinson disease (PD) patients at the end of life is about equal to that of patients with amyotrophic lateral sclerosis (ALS) but is significantly under-treated, according to a study presented here in May at the AAN meeting. A neurologist who specializes in palliative care agreed with the authors of the study that it should prompt clinical neurologists to get more involved in ensuring appropriate care for all patients at the end stage of progressive neurological diseases, and for academic neurologists to conduct more research on end-of-life problems. “Patients are not receiving the symptomatic care they need, and unfortunately, many neurologists are not prepared by their training to talk about management of end-stage disease,” said Wendy S. Johnston, MD, associate professor of neurology in the Department of Medicine and director of the ALS/Neuromuscular Programme [sic] at the University of Alberta in Edmonton, Canada. Dr. Johnson was not involved with the current study. Contributing to the lack of research and treatment, she said, is the perception that while ALS is invariably fatal, Parkinson disease is treatable. Medical textbooks generally state that little is known about the end-of-life needs of PD patients, said a co-author of the new study, Elizabeth R. Goy, PhD, a geriatric psychiatrist at the Portland Veterans Affairs Medical Center in Oregon. “This is our attempt to fill in the gaps on what happens,” Dr. Goy told Neurology Today during an interview at the poster presentation. She and colleagues at Oregon Health Sciences University (OHSU) interviewed 54 caregivers of deceased Parkinson disease patients about the patients' symptoms, challenges, treatment preferences, health-care usage, and psychosocial experiences during the last month of life. They compared the results to those of 50 bereaved ALS family caregivers who had answered identical questions in a previous survey conducted by the same group. Seventy-eight percent of caregivers reported Parkinson disease patients had frequent to constant difficulty eating. The most common physical symptom was impaired communication, according to 63 percent of the respondents, while 54 percent of the caregivers reported confusion and depressed mood as the most common psychological symptoms. Pain was of at least moderate severity in 44 percent of patients, caregivers reported, yet one-fourth of these patients received no pain medication in the last month of life. The median level of suffering, rated on a scale in which 1 equaled no suffering and 6 was the most severe, was 4, identical to the median level of suffering seen in the previous study of ALS caregivers. PD patients were more severely affected by confusion than ALS patients. However, those with PD were not as affected by dyspnea and had less difficulty eating. While neurologists are closely involved with the care of PD patients as long as they are well enough to make it into the clinic, “In the end stages, they're often homebound, so they sometimes fall off neurologists' radar,” said Dr. Goy. While praising the researchers for taking an important first step in developing a literature on the end-of-life needs of patients with progressive neurological disorders, Dr. Johnston acknowledged that many neurologists might feel themselves unprepared to offer appropriate palliative care. If neurologists do not offer end-stage treatment themselves, however, they should ensure that the care is being provided by a competent specialist, Dr. Johnston said. On the same six-point scale used in the PD study, suffering was rated as 4 or greater by 20 percent of patients, with 19 percent rating their pain as 4 or greater. In addition, 11 percent of ALS patients were suffering from clinical depression. The correlation between subjects' and caregivers' rating of the patient's suffering was r = 0.47. Yet physicians frequently failed to recognize and treat the pain and depression. 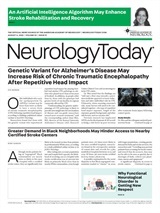 Neurology Today7(12):16-17, June 19, 2007.